This challenge was issued a decade ago. It occurred on a rare visit to Sheekeys Restaurant in London. The food was delicious and expensive. My friend and I sat on two stools facing the bar sipping white wine as dry and crisp as any I have tasted. Both well-fed and probably a little self-satisfied we talked about Elvis. I mentioned the ending of the revised edition of the documentary ‘That’s The Way It Is’ and the appearance of Cary Grant in the after show party. I described how the two men appeared to swap identities as they talked. Cary Grant had told Elvis that he had been hot. Elvis had said that he was probably a little too nervous. Grant was edgy and modern American while Elvis was relaxed and almost haughty. His southern accent languished into something like aloof English. ‘Come, come,’ said my friend. My surroundings were no longer quite so enhancing. The people around me were different and I suspected the impact of the bill would be less on them than me and that they would return before I did. It was neither the place nor the time to compare a flash poor white Southerner to a charming English sophisticate once voted the best dressed man in Hollywood. These were the circumstances of challenge number two and I have taken my time in responding and that says something about me. The biography ‘Haunted Idol’ which refers to Cary Grant and not Elvis gives plenty of detail. Archibald Leach arrived in Hollywood a working class Englishman who left home to join a circus. No, this did not inspire the story of Pinocchio. Pinocchio was made of wood and Cary Grant was anything but wooden. Like Elvis he used his body to enhance his performance and, again like Elvis, he was versatile. 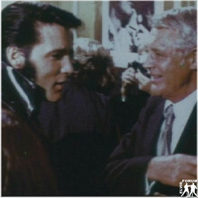 Elvis could rock and sing ballads and Grant was equally comfortable in comedy and drama. This circus travelled to America and somewhere along the way he left the big tent and became a Hollywood actor. His early films, especially those with Mae West, reveal a different Grant to what emerged later. Grant is no less confident but instead of the superior sophistication we have a defiant swagger. This has been not properly recognised because in these films he also had a tendency to overact. But his defensiveness and street cockiness are plainly evident as they are in a more charming way in the classic ‘Gunga Din’ by the great director, George Stevens. Grant was not ashamed of his working class background but like Elvis he wanted more. Indeed, the two men wanted both authenticity and luxury, or maybe something more complicated than luxury that involved status and personal power. Elvis curled his lip and Grant talked as if he was breathing rarefied air. Both mannerisms suggest an insistence on recognition and acknowledgement. The more conservative could argue this is why the two men became so haunted. They simply wanted too much, a consequence of narcissism and its always attendant gluttony. They paid a price. Both suffered depression and insomnia for most of their lives and both felt entitled to experiment with ‘medication’. The word entitled is important. Grant and Presley were not alone in taking drugs but what they did have in common was a belief that their position or their work entitled them to unusual medication. Elvis shovelled in pills and Grant tortured himself with LSD hallucinations. But they began as working class men and though they had an image that insisted on their separate superiority they were always loyal to their class and its habits. Both enjoyed the taste of basic cooking. Elvis liked bacon, mash and gravy (not available in Sheekeys as it happens) and Grant was so fond of bangers and mash he insisted it was served on Christmas Day. Undoubtedly, a key factor in the loyalty of both men was their devotion to their mothers. It is not fanciful to assume this devotion was exacerbated by feelings of guilt. The mother of Elvis died early when he was in the Army and the mother of Grant was kept in a lunatic asylum for a large part of his life. When he was seven years old he had been told by his father she had died. He was already a superstar when he learned the truth. He became devoted but their different circumstances meant they lived very different lives. To the European outsider it is tempting to think of Hollywood as a home to the successful but it also represents American privilege – the best parties, the most adoration and, last but not least, the most beautiful women. This was even better than what happened to David Cameron at Eton and Oxford. The problem for Elvis and Grant was they could only enjoy the privilege with the knowledge that the women they loved the most had been removed from their lives. Grant, of course, survived into old age but he was of a different generation, one that never understood excess as well as that of Elvis and his peers. He also had fabulous genes while Elvis was prone to fat. That is why the scene at the end of ‘That’s What It Is’ chills. If their identities could merge so easily how much did chance influence their very different fates? We will never know. No two personalities are the same and the slightest tilt in circumstances will have a significant effect. The English found it inconceivable that Grant leaped across the English class system in the athletic way he did and it probably would have been impossible if he had stayed in England. Being an Englishman in America not only helped his self-esteem but helped others to groom him effectively and helped him to re-invent himself as a creature of our dreams. Elvis dealt in dreams as well but he did not have the luxury of being the unfathomable alien. He was merely unfathomable. Grant secured adoration because of the confusion. He side-stepped European social class while Elvis rejected racial and gender certainties. For many Americans this was more uncomfortable than their homegrown idealised Englishman. Elvis also had adoration but he also had to endure contempt. Both men were obsessive about fashion to the extent it generated phobias. Elvis insisted upon high collars and Grant could only wear jackets with narrow armholes. The fashion phobias occurred because they were needed for their alternative identities. Originally, their identities had been liberating, especially as they had attracted privilege but their mothers had been sacrificed so they were obliged to understand the price that needed paying – loneliness, alienation and self-hatred. When Grant was told by someone, ‘I would love to be Cary Grant’ the actor replied, ‘So would I’. Towards the end of his life Elvis met his drummer D J Fontana. ‘I’m so tired of being Elvis Presley,’ he said. The statements compliment remarkably well. It is certainly possible that the remarks reflect different core natures, one maybe haunted but ultimately more sunny. But if there are differences the remarks are all too illustrative of what they had in common. What united them and, I like to think they recognised in each other, was success and the price that followed. In their case the price was demanded because of their social class and their punishing family circumstances. Elvis found the price to be unmanageable. Grant endured but with significant cost and pain. All of which makes me think from time to time of that evening in Sheekeys. ‘Come, come,’ my fellow diner had said. I’d forgotten that bit with Grant in the Elvis doc and hadn’t realized how many similarities they had. Certainly, Grant was able to have insider status in Hollywood as a foreigner because the class system in America was and is based on different things than the class system in the UK. It was weird to me in the 1980s, when they remade Lord of the Flies as an American film. In the book and original movie, it was the boys accents rather than their physical appearance that resulted in the class system. and when you have British schoolboys and American military students, you aren’t starting with the same assumptions about civilized society. I think part of Elvis’ appeal was that he never forgot his roots and the same for Cary Grant. I read that Grant used to charge quarter for an autograph and he donated this money to the Old Actor’s Pension fund to help out those actors erased by time from the public. Maybe Elvis & Lord of the Flies could be a future challenge?